Meralco will live to fight another day. 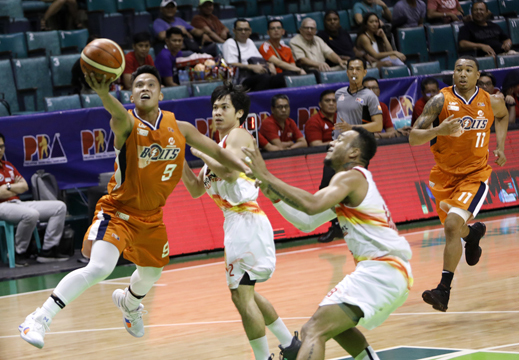 Meralco Bolts guard Baser Amer (right) stretches in for a layup attempt against Phoenix Fuelmasters defenders, from right: Calvin Abueva and LA Revilla. The No. 7 seed Bolts unleashed a booming third-quarter surge to help them rout No. 2 seed Phoenix, 90-74, and survive in the Quarterfinals of the 2018 Philippine Basketball Association Governors’ Cup at the Cuneta Astrodome in Pasay City last night. Reigning two-time Best Import Allen Durham once again unloaded a monster game, finishing with 26 points and 16 rebounds for a double-double to lead the way for Meralco. The backcourt tandem of Chris Newsome and Baser Amer provided a lot of support, scoring 18 and 16 markers, respectively. Meralco, who entered with a twice-to-win disadvantage, unleashed a critical 17-2 run midway in the third to get some needed separation and a double-digit lead in the contest, 60-45, after a lay-up from Durham at the 4:37 mark of the period. That decisive stretch proved to be the difference for the Bolts as they were able to sustain their run to secure the victory. Meralco carried a 66-55 lead into the payoff period and never looked back as Phoenix was unable to respond. The Bolts and the Fuelmasters will meet again tomorrow in a deciding rubber match to see who moves forward to the semifinals. The winner between them will face the victor in the series between No. 3 Alaska and No. 6 San Miguel, who are going at it as of this report, in the next round. The Aces, with a twice-to-beat advantage, are trying to clinch a berth in the semis as they are working on toppling their nemesis in the Beermen. Meralco outscored Phoenix, 33-20, in the vital third quarter. The entire first half was actually a seesaw battle which saw Phoenix carrying a slim 35-33 edge. Meanwhile, on the other side of the fence, top seed Barangay Ginebra and No. 4 Magnolia, who both maximized their incentives, are both already through to the semifinals. They face each other in an anticipated best-of-five affair in the next round.